"When did we stop being people, being human?" Following the events of Noughts & Crosses, Sephy is trying her best to raise Callie Rose alone, with little to no help. Until Meggie offers to let Sephy move in with her so Meggie could help Sephy cope. In the meantime, Jude is running from the police. He's filled with hate and grief for Callum. His hatred for Crosses is stronger than ever. He's determined to kill. Sephy is so different from the old her in Noughts & Crosses. She's still grieving, and struggling to take care of her daughter single-handedly. Then there's all these other Crosses who are scorning her, telling her that she is a 'blanker-lover', someone who loves Noughts. Everyone disapproves of her mixed-race daughter and it's hard on Sephy. She also joins a band as the lead singer, and she runs into a lot of people in clubs. She's the only Cross in the band, which was taken badly by the others. Jude on the other hand, is struggling to deal with his anger. He meets a Cross girl called Cara, who he falls slightly in love with, but freaks out when he finds out. Cara was completely the opposite of what Jude saw Crosses as, and it scared him. Knife Edge is split into 4 different parts: Red, Orange, Yellow, Green. Each symbolises a part in the book. At first, it starts with Red, meaning that hate, anger and grief is everywhere. It's also like a traffic light; everyone is stuck where they are- they won't move on. The the story slowly moves on, and finally in Green, the story reaches it's peak and it finishes. 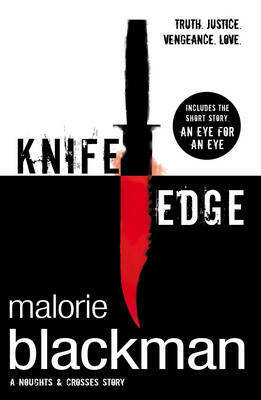 The tone of Knife Edge is different from Noughts & Crosses, especially because this book is more harsh and filled with more remorse and rage. It's a great sequel to Noughts & Crosses and it's a fantastic read.